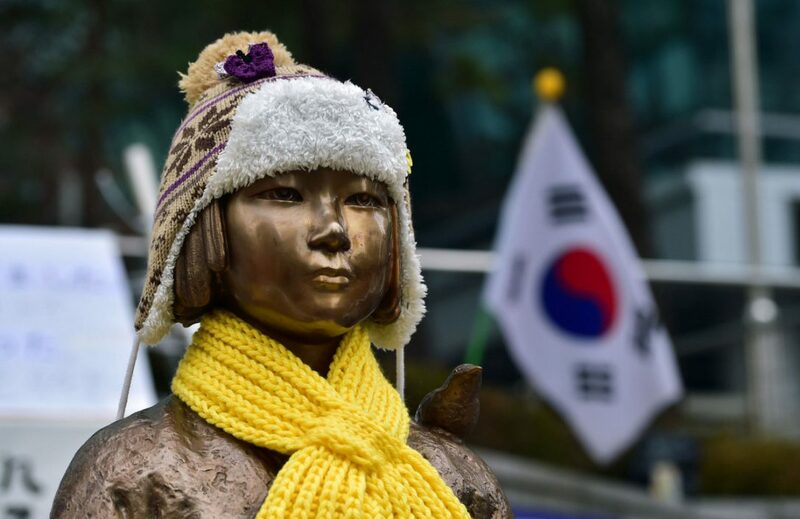 The statue that is in front of the Japanese embassy in South Korea serves as a reminder of the saga of the Korean comfort women who have come forth with testimonies about what happened to them. Many days, the statue is surrounded by volunteers who want to keep vigil around it. This was all fine and dandy, as South Korea and Japan had finally reached an agreement about the Korean comfort women, involving Japan’s admission of responsibility and the payment of one billion yen to women who came forth with their testimonies. However, another statue was erected next to the Japanese embassy in Busan, which is the second largest city in South Korea. The statue was erected by an agency that does not represent the government. In fact, the government initially sent people to take it down. However, the organization that put it up the first time put it up again. This time, the government did not take it down, because public sentiment in South Korea had slightly turned against Japan after a Japanese official visited a shrine that commemorated Japanese war heroes. On the other hand, this event also made people in Japan very angry. Many thought that they had finally resolved the issue when they reached the agreement. After all, the agreement said that it was final. The problem was that it seemed like some people in South Korea were not honoring the agreement. Japan got angry, and President Abe ordered that his top diplomats in the two largest cities of South Korea return to Japan. Japan also threatened to stop an agreement that they were working on that would help the South Korean economy by protecting its currency. The people of Japan felt betrayed by South Korea, feeling that they had honored their side of the agreement but that South Korea did not honor their own side. The problem lies with elections and politics in South Korea. The previous president, President Park, was brave in going forward with the agreement, but she did not honor her promise to remove even the original statue in front of the Japanese embassy in Seoul. She was later removed from power because of nepotism charges. Opposition parties have been campaigning against the agreement, so it seems that those who are running in the elections would want to keep the statue in order to woo that sector of the population and win their votes. If the opposition party gains power, then it is very likely that the agreement will be tossed aside in its entirety. There are other issues that are affecting the stability in South Korea. For example, there is the issue of unemployment. China has been pressuring South Korea on a number of issues. China has also been buying fewer things from South Korea, instead buying things that they make in their own country. This has affected the economy in South Korea. In addition, there is the issue of Samsung, which has been in the news after its smartphones were found to be defective and had a risk of catching on fire. South Koreans, understandably, felt somewhat hurt and embarrassed. In other words, old wounds that seemingly healed were now reopened again, as the time was ripe for it. Now, it is true that President Abe feels hurt. He risked a lot of political strength when he agreed to resolve the issue and admit responsibility. However, he has to be strong and send back the embassy officials. He has to do all that he can to make sure that the agreement continues to be adhered to and that relations between the two countries continue to get better.